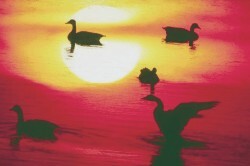 The duck is a symbol of the soul; silvery colour, the spiritual consciousness; golden wings, the power of the Divine Truth. It is usually the symbol of the soul or inner being, perhaps it was the four beings, mental, psychic, vital and physical that you saw. Nothing done in the past or present can prevent the psychic from coming forward if there is the true will to get rid of these things and live in the psychic and spiritual consciousness. The psychic, when it acts as the main power, acts through a certain feeling and inherent psychic sense which repels the falsehood. But the ranges of mind above mind do not act in that way — there it is discrimination and will that act and their action is wider but less sure and less automatic so to speak. The spiritual transformation proper begins or becomes possible when one rises above the mind and lives there governing all from above. Even in the psychic transformation one can rise above by a sort of going above of the mental, vital, physical being and a return, but one does not yet live above in the summit consciousness where overmind has its seat with the other planes that are above the human Mind. The supramental transformation can only come when the lid between the lower and higher hemisphere or halves of existence is removed and the supermind instead of the overmind becomes the governing power of the existence.